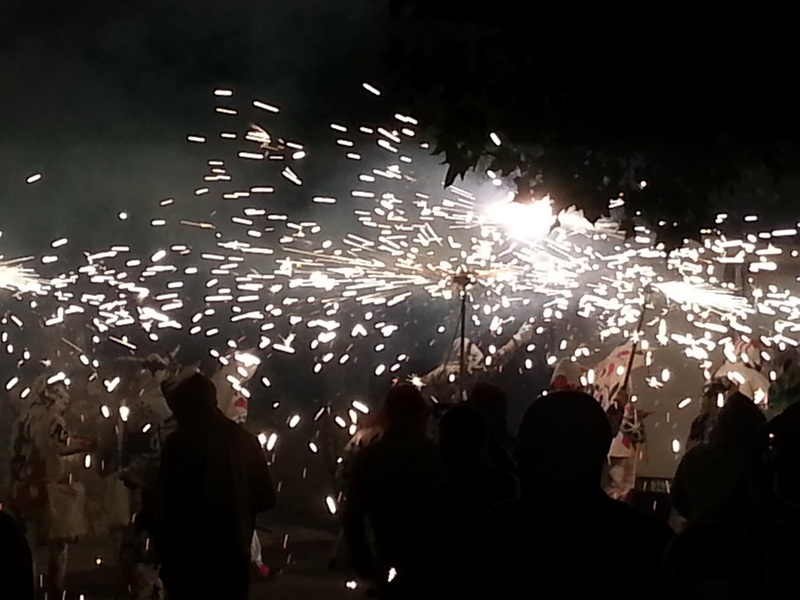 The Correfoc is a Catalan fiesta which translates as Fire Run and it’s certainly not an event for the faint-hearted or for those of a nervous disposition! The ‘colles de diables‘ or groups of devils wear costumes decorated with intricate designs, all slightly different and I would imagine costing quite a bit of money to make. Others wear capes and evil looking devil masks and they all parade in the dark accompanied by groups of drummers who beat out a steady refrain. The ‘devils’ move to the beat in a shuffley sort of a dance and they carry pitchforks or frameworks like big chandeliers above their heads with spitting, spinning roman candles mounted on top of them and then the devils dash towards the crowds spraying bystanders with sparks. As the fireworks burn out they blast high into the air with loud bangs and the night is filled with smoke and the smell of gunpowder. 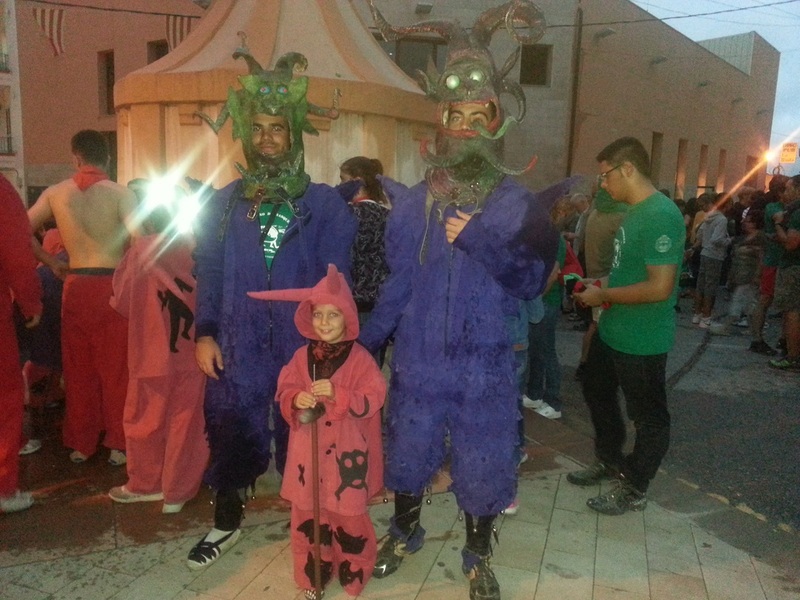 The dancing devils are accompanied by men in dragon costumes who have fireworks attached to the dragons’ backs and who snort fire at everybody as they weave their way along the streets of the towns and the villages. 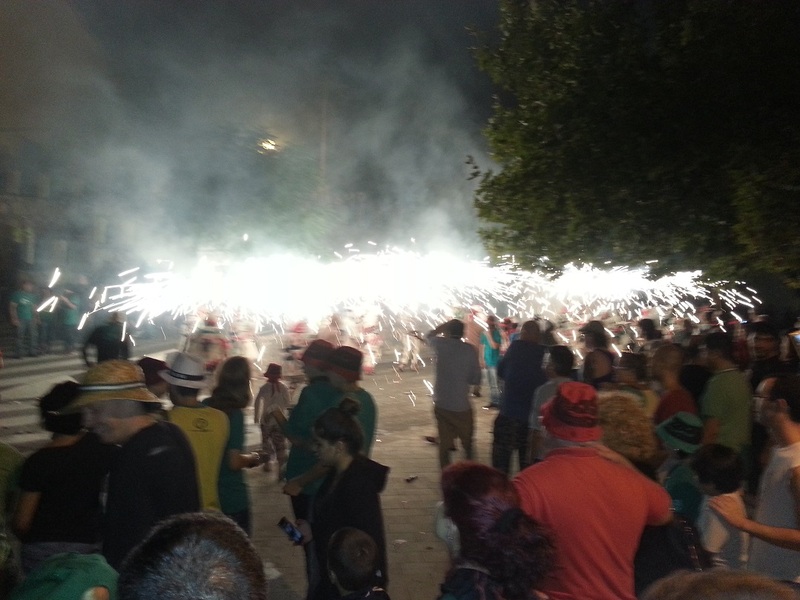 I took part in a Correfoc fiesta in a little Catalan mountain town, where the narrow cobbled streets echoed and crashed with noise and there was nowhere to run. Cowering under trees then dashing forwards when there was clear space, we followed the procession – fire running – to the square in front of the church where the devils regrouped and doused themselves with water, before returning along a different route for their amazing finale. The whole time, children nip in and out and taunt the devils, wearing their own miniature versions of the costumes, complete with scarfs, hats and fireproof gloves and they are also dampened down at regular intervals. 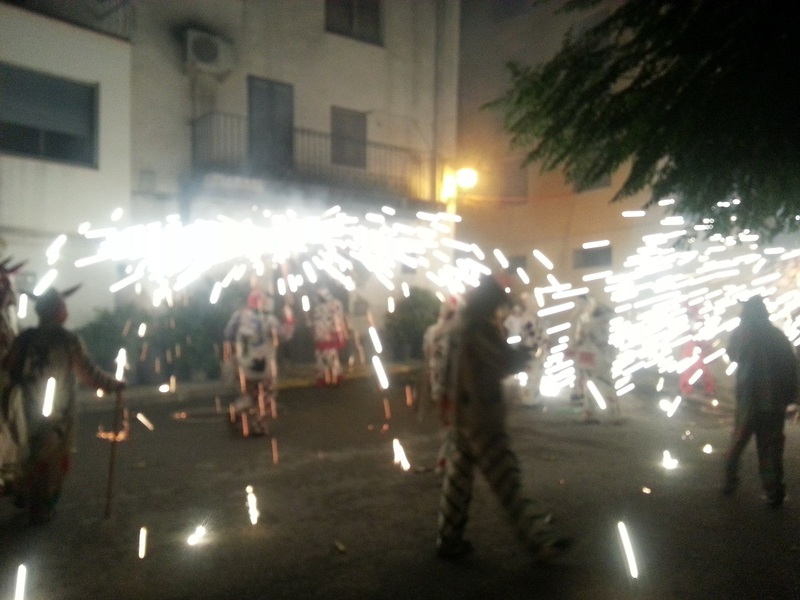 Surprisingly the Correfoc is not an ancient tradition but it was resurrected after Franco’s rule as a way of establishing a Catalan identity. Sadly, the EU are doing their best to regiment the events which they claim are dangerous and are trying to ban it or at least turn it into a sanitized show piece with no audience participation. Yes, it can be dangerous. Yes, there was a big queue waiting for their injuries to be dressed at the ambulance station. Yes it was scary but wow, what an experience. If you are going to attend a Correfoc dress accordingly – wear old clothes and cover your hair, and as for the Health and Safety mob – well, if you are worried, stay at home. As the procession reached its finale, all the participants crowded together, tightly packed into the square. The drumming became more frenzied and everybody crouched low and then jumped up in a ritual dance and then, in a last blast, all of the hoses were lit and night became day. Our fiesta went on for nearly two hours and I don’t think that my pulse stopped racing at all. I don’t know when I have ever sustained such an adrenaline rush for such a long period of time. I do know that I was grinning as wildly at the end as I was at the start once I realised that I was probably not going to get burnt to a cinder. That sounds like an amazing festival! Spain is so lively. Last year I was in Lograño during Easter and got to witness their spectacular parade of men dressed in their guilds costumes that unfortunately look like the KKK outfits because the KKK stole the look for their evil organization. Glad it didn’t make the Spanish change their ancient custom, it isn’t their fault that someone exploited their beautiful tradition of marching and carrying effigies of the Stations of the Cross. Anyway, that festival sounds scary but amazing to watch. I love what the EU stands for but I think it is deplorable that they are trying to homogenize European culture. You can be a federation without stamping out individuality.